This week as much of the world noticed, Google unveiled a substantial number of new hardware products and an AI consumer-focused strategy linking things together. As was alluded to ahead of time, 10.4.2016 would be a day people will reflect upon in the future though clearly now not for the reasons many people might have projected. From my perspective, Google came out swinging and hard. They are finally taking a bold stance with their brand and it looks like there will be some considerable marketing to follow. While on the surface, it would be easy to draw some parallels to the Nexus products of the past Pixel re-claims the previous higher end category, but pushes matters forward as the primary, rather than niche approach. Google very clearly drew comparisons to Apple with the Pixel phones (mainly physical) but as I’ve let things sit in, it’s even more clear how aligned this playbook is …and should be given the clout they can rightfully claim. 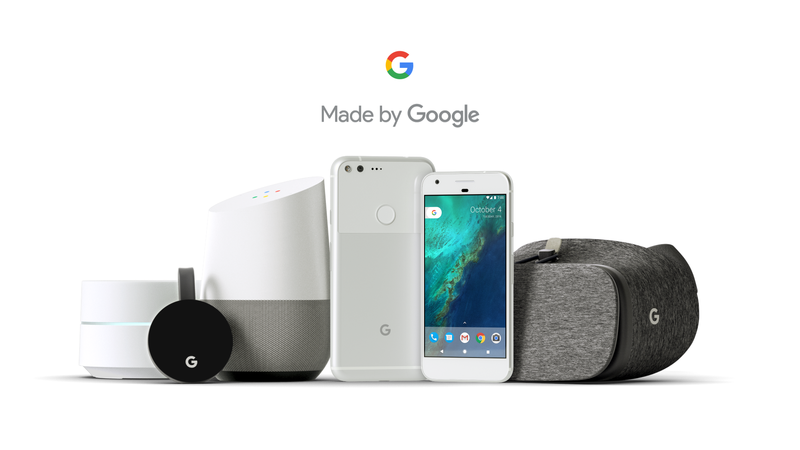 MadebyGoogle is the tag defining Google themselves planned and designed the full stack experience on the devices. Previously they had consulted / designed, but partnered with an OEM to co-brand and market the products (Nexus, OnHub , AndroidTV…) but this is a new game. Google is the maker and sure HTC is the actual contract manufacturer (and a grreat one) but that’s the end of it if we believe what’s been stated publicly and I see no reason to doubt matters. Google’s role will also be to manage the channel, partner with retailers and develop the carrier strategy which in the US is to utilize Verizon as an exclusive partner. 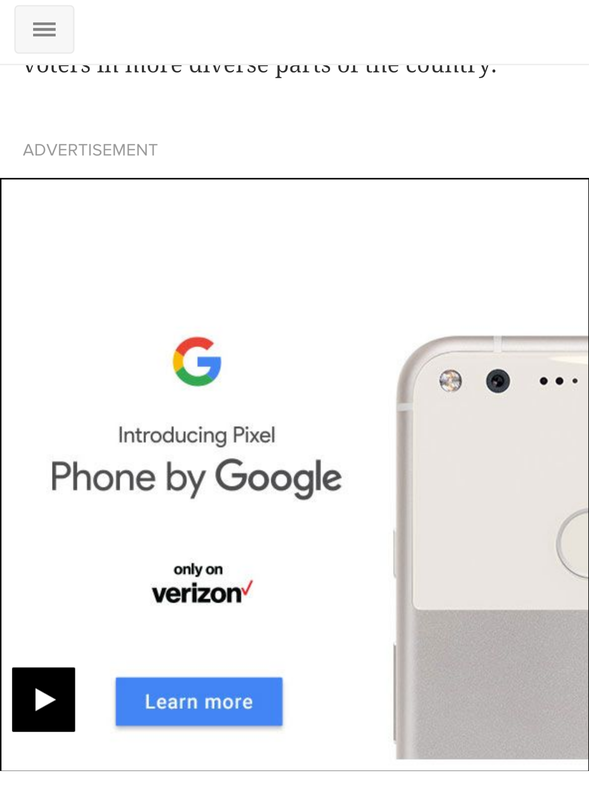 Verizon is touting the Pixel on their home page and actively promoting things through some online units as well. The OLA I spotted may actually be Google helping to promote Verizon as it links back to the Google Store vs VZ. Verizon does not seem to be adding anything to the device – no branding and no carrier apps – a refreshing change and of course exactly the same as the iPhone. There was some hubbub last night around the Pixel specific features within Android 7.1 not coming to the broader base of Android devices including Nexus. I don’t see an issue with this and frankly believe it’s the right choice for Google to make. If Google is going to take a strong position their devices need to be empowered and maintain a POV comparatively. While there are certainly going to be Android OEMs and others to consider (for now anyway) Google has proclaimed it’s position at the top of the pyramid. The reason to choose something MadebyGoogle vs another should be obvious and I’m clear … and committed. AI is threaded through the main products announced this week and works behind the scenes to personalize and enhance the collective experience. On the Pixel, we have the Assistant which until now has been quietly sitting inside the Allo messaging app. Instead, the Pixel releases the Assistant, replacing the Google Now experience on the Nexus. Now cards (thankfully) remain with a swipe to the left on the Pixel launcher (and interestingly not in the leaked version) but the Assitant as Sundar suggested is designed to provide a personal Google for everyone. On the Google Home device, which I think is an absolute Alexa killer, the Google Assistant will provide answers, control various devices and with a supposedly great speaker let you enjoy the streaming media of your choice. Because I’m so invested in the Google ecosytem, I’m confident that the information provided by Home will be relevant to me … I’ve been seeing suggested content in Now for a long time and stay signed in all the time so I’m basically all in which is clearly the goal. One question remains which is how a household will be managed … I’m hopeful that voice can serve as a future token for multiple accounts without too much effort on the user-end. Since our Google Home will initially sit in the kitchen, my whole family of 5 will make use of it … my kids were quick to identify Alexa’s weaknesses in answering questions and know how much more easily Google can provide a solution compared to Siri. If we were to have more than one Google Home (like say in the kids’ rooms) and each was signed in by that person how or would they all still work together? I’m sure that will be answered within the coming months … especially as each of us will start to expect the recommendations and learning be applied on a more individual level. AI will also be loaded on the Google Wifi system to help manage connections and ensure the best is provided to each device as you move through your house – especially if you choose the mesh option (as we’d likely do) to cover a whole house. On the marketing side, I’m very curious to see how this all plays out. During the keynote and in the launch video for the Pixel, Google took a swipe at Apple for the headphone jack which was cheeky and a bit of a wink (no number name, headphone jack and the clear Apple storage alert) though it’s sets the stage for who they see as the competition. To reach a scaled level of awareness there’s going to have to be a real push on the outbound side beyond the typical digital ads you see. I’d expect some co-marketing for and from Verizon as they have a new halo device to sell. Google interestingly offered an exclusive color for VZ, but limited the capacity of the device to 32GB compared to the up to 128GB option in the other two colors directly sold by Google or other retailers as they light up like Best Buy. There seems to be an interesting moment for Google to get into the minds of switchers here too … as there’s been some ok but not great reception to the evolution vs revolution status of the iPhone 7. In the box and on the device is a switch app and connector designed to migrate everything from your iPhone …. or other device. Holidays are always an interesting time for CE purchases so I’d expect a boost through the end of the year just as part of our natural consumer purchase habits. Hopefully that will inspire a broader push and we’ll see Google with their foot on the gas going forward … Apple has a helluva headstart. Next Next post: BMW Films is Back!